Amigapd would like to thank Andrew Brewood for for taking time to answer some questions about their wonderful game Plasma Bubble. You can find out more about the game from their website website. This interview was completed October 2012. Plasma Bubble - Francis Irving and Andrew Breewood - image from Francis's website. How old were you when you wrote Plasma Bubble? was certainly before we left school at 18. You describe Plasma Bubble as your most complete game. What elements did you still want to work on or which features were you still hoping to add? that too, and there were probably a few things that didn't get implimented. What was it about the boulder dash / Repton games that inspired you to make a game in that genre? AB: Personally I enjoyed the real-time puzzle-solving aspect to the Repton/boulderdash games. These days, one of my favourite genres of videogame is Tower Defence, which often has a real-time puzzle aspect. Andy Brewood designed most of the levels, how did he become involved with the game? AB: Francis and I were classmates and friends at Secondary School. I was involved in playtesting the game, and once the level editor was added, I was able to unlesh my fiendish creativity. I'm quite sure there are some levels I created then, that I wouldn't be able to complete now. Your website mentions another game Creatures 3 but unfortunately the link doesn't seem to be working. What was this game and is it too freely available for users to play? 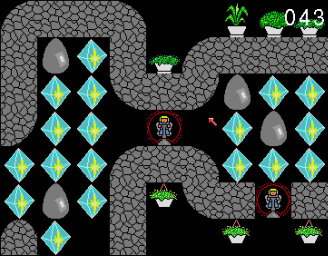 AB: Creatures 3 was a commercially released life-sim game for Windows and was part of the Creatures Series. It is still available as part of the "Creatures Exodus" compilation on gog.com and from some retailers. Are you, Raymond or Andy still involved in the computer or gaming industry today and if so are there any projects which you are currently working on which you would like to share with our readers? AB: I work in IT as a System Administrator, but other than as a consumer, I'm not really involved in the gaming industry. I do however contribute to a videogame website - videogamegeek.com as a community member, submitting game details, reviews, screenshots, discussion etc. Plasma Bubble can be downloaded from Francis' website along with the original source code. Below is an ADF for Plasma Bubble. Below is an archive file of Plasma Bubble for standard Amigas. AmigaPd would like to thank Francis and Andy for answering the questions and making his game available for the Amiga community.